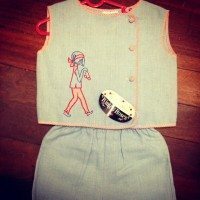 This is an original child’s playsuit that is as new, never worn, still with tags. It features a cute button up crop top with matching shorties in pale blue with red details. The crop top features an adorable design of a girl and her sunglasses. So summery & sweet. The playsuit is in mint condition & would suit a little girl aged 3 – 5yrs.